Obamacare and other forces have significantly changed the landscape of healthcare. Many provider offices are now focused on the management of their high-risk patient populations, including diabetics, asthma sufferers, and those with heart disease. At this point, I had not built up my UX team yet, so I was the only User Experience professional working at NaviNet. Knowing I would need some help in order to conduct a large field study, I reached out to Experience Dynamics, a dedicated UX firm based in Portland, Oregon, that I had extensively worked for in the past. Because of my successful history with Experience Dynamic’s CEO, I already was confident that we would make fantastic partners in this user research effort. Together, we designed the study, conducted the physical site visits, and analyzed all of the results. NaviNet’s Chief Medical Officer, as well as the other stakeholders, were very excited and pleased with the results. The research findings and resulting personas have since been leveraged over and over again. 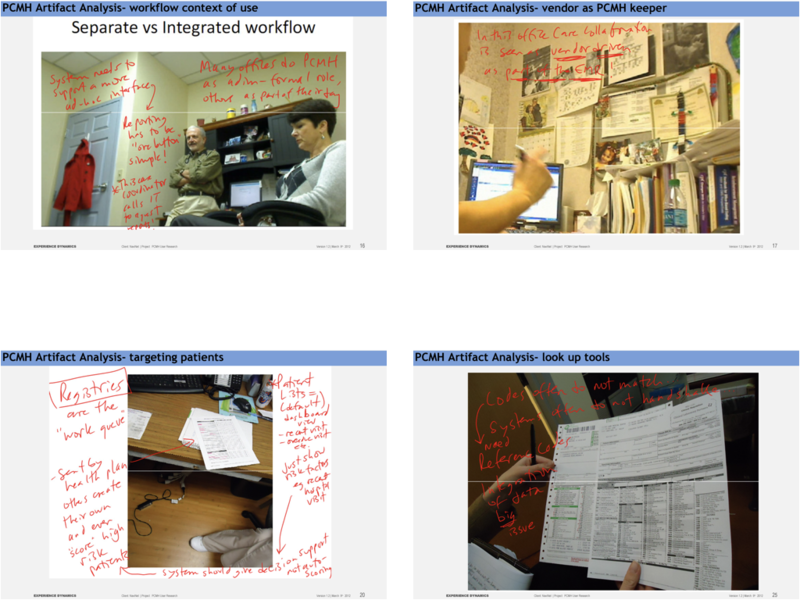 They were a valuable resource when we designed our Patient Dashboard proof-of-concept. They were also presented at our annual Customer Forum. In this study, we spoke to 20 participants from PCP offices and hospitals in Massachusetts, Rhode Island, Connecticut, and Pennsylvania. 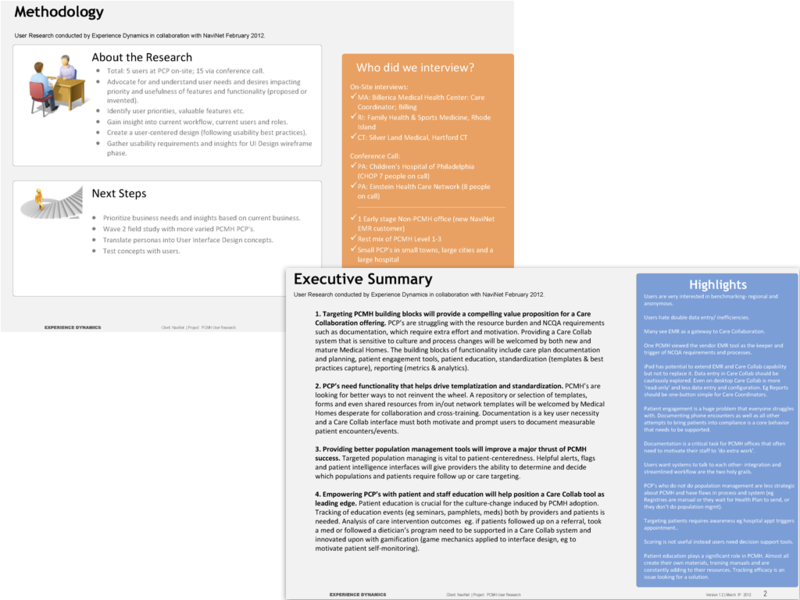 We summarized our findings with a set of high-level recommendations and research highlights. This study helped us identify 5 major themes or components of care collaboration, all centered around patient engagement. These supporting themes included targeted population management, care plan documentation, reporting, and standardization. We translated our research into 7 personas: 4 primary and 3 secondary. 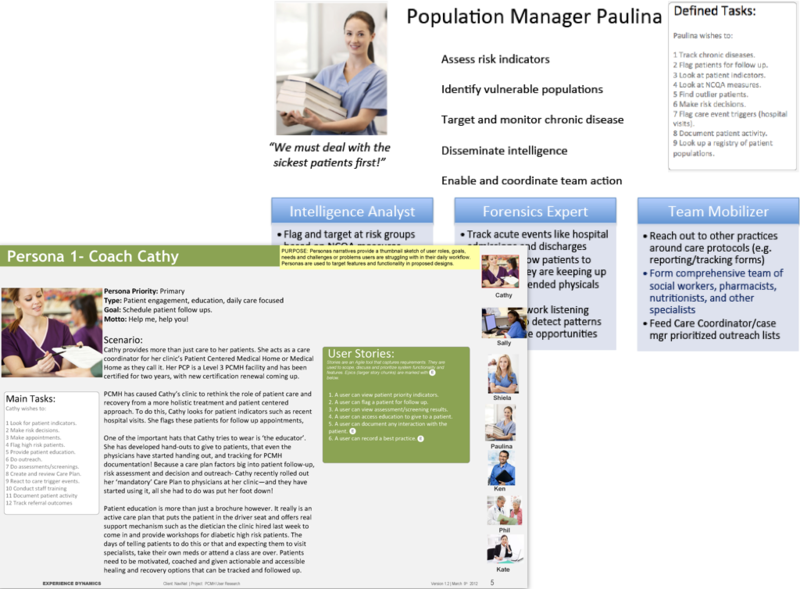 The primary personas closely reflected the key care collaboration components that we identified. 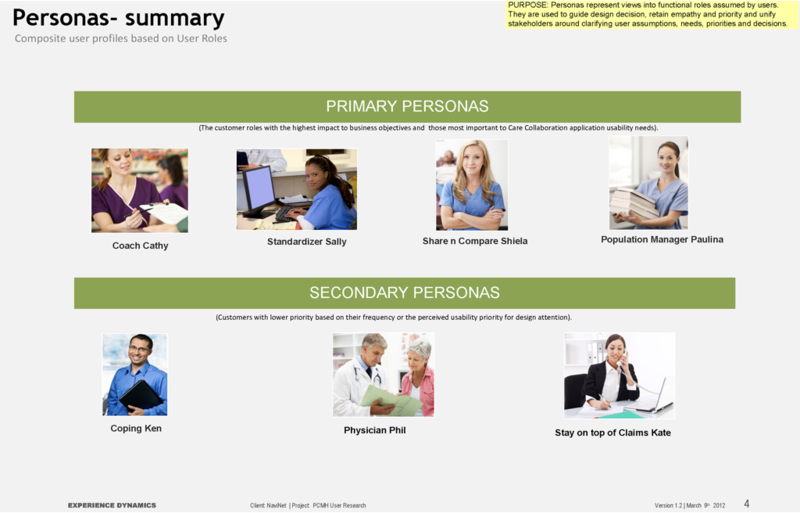 Each persona included main tasks, user stories, goals, desires, paint points, and a detailed scenario. For our Customer Forum, I redesigned the personas into a less dense format that was more appropriate for presentation slides. In this alternate persona format, I broke the detailed scenario down into role-based sub themes. After laying out each persona, we came up with a task matrix, which listed all of the Care Collaboration tasks that we discovered. 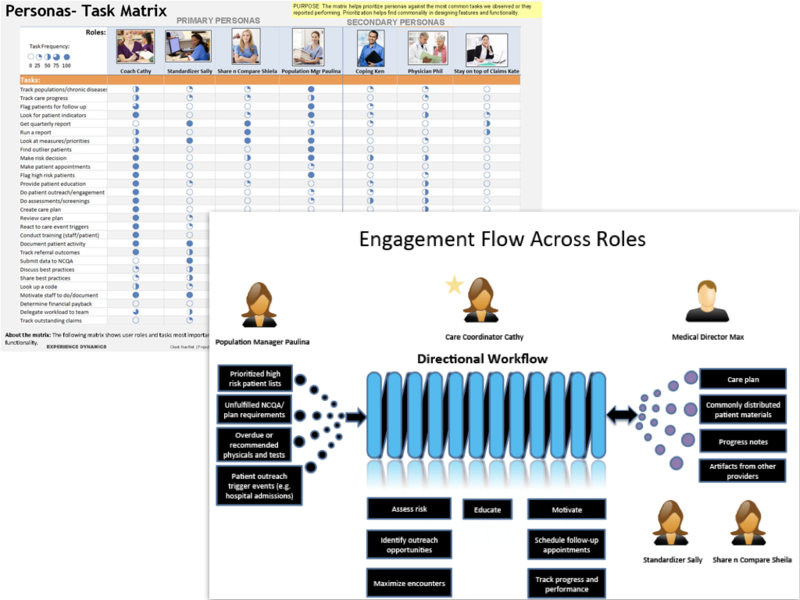 The matrix helped illustrate how much involvement each persona had with each task. We also created an Engagement Flow diagram to help stakeholders understand exactly how the various personas work together to engage patients and provide them with more effective, higher quality, proactive care. 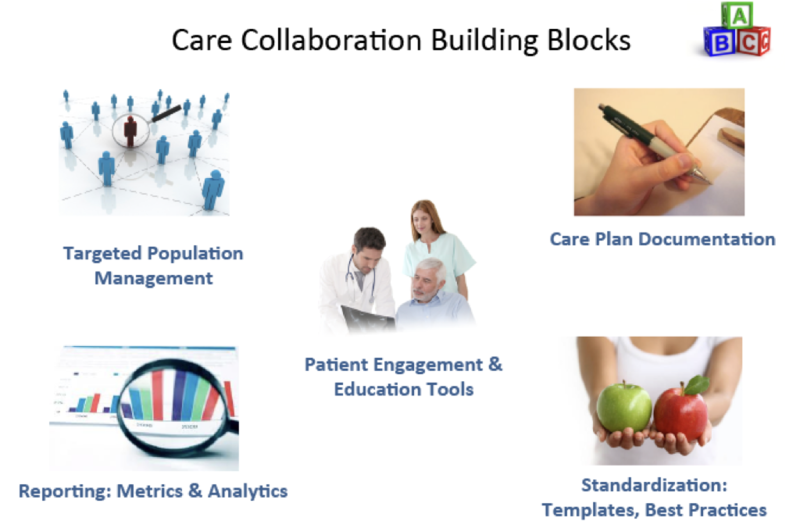 Our study was primarily focused on the Patient-Centered Medical Home (PCMH) model of care collaboration. Becoming a PCMH is really the result of a procedural and organizational evolution. Each office we visited appeared to be at a different stage of this evolution. 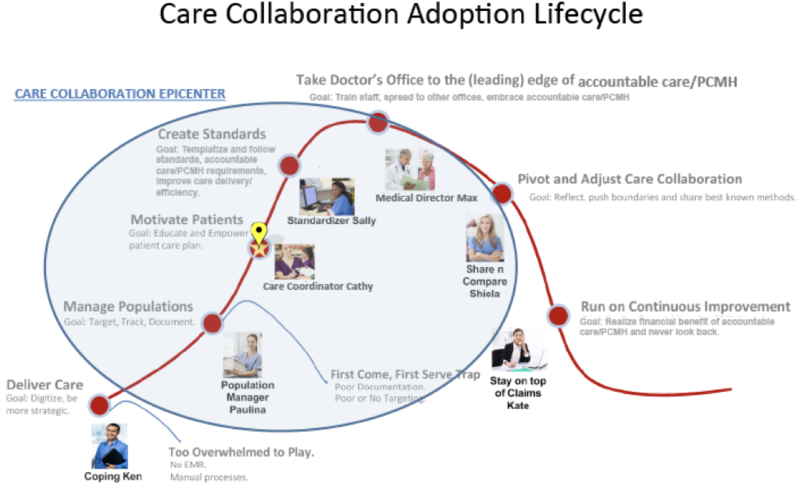 Therefore, we created a diagram to illustrate this overall care collaboration adoption lifecycle. Based on their primary responsibilities and functions, we inserted each persona in the appropriate place on this lifecycle curve. At each site visit, we collected as many artifacts as possible in order to gain a better understanding of how the office operates. These artifacts helped us remember key highlights of each interview. They also enabled us to intimately make sense of the various interactions that occur in these offices, both between staff members, as well as between staff and patients. I used our research findings and personas to design a proof-of-concept for a NaviNet Patient Dashboard application that we were planning to develop. 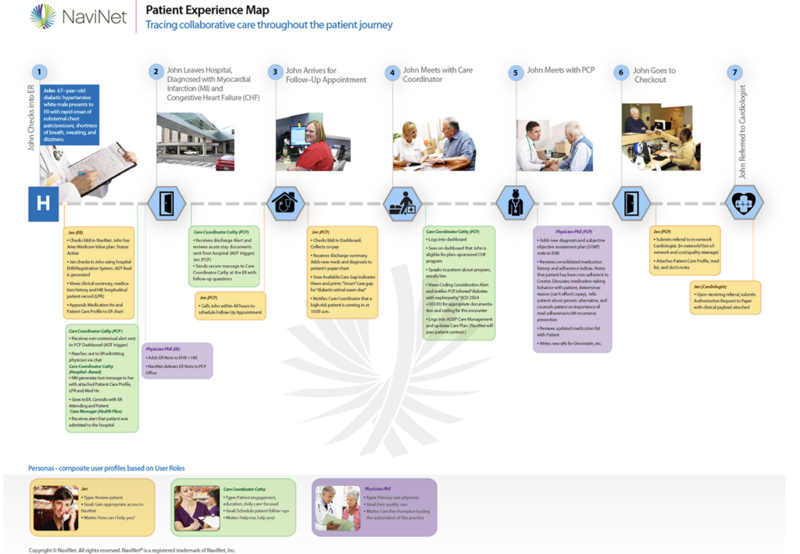 In order to fully communicate this concept to our customers, my UX team worked closely with NaviNet’s Chief Medical Officer and Business Development group to produce a Patient Experience Journey Map that graphically illustrated the care collaboration workflow. This is the Patient Dashboard proof-of-concept prototype I designed and produced. Inspired by the Kayak travel booking website, this dashboard offers provider staff a comprehensive summary of their patients. 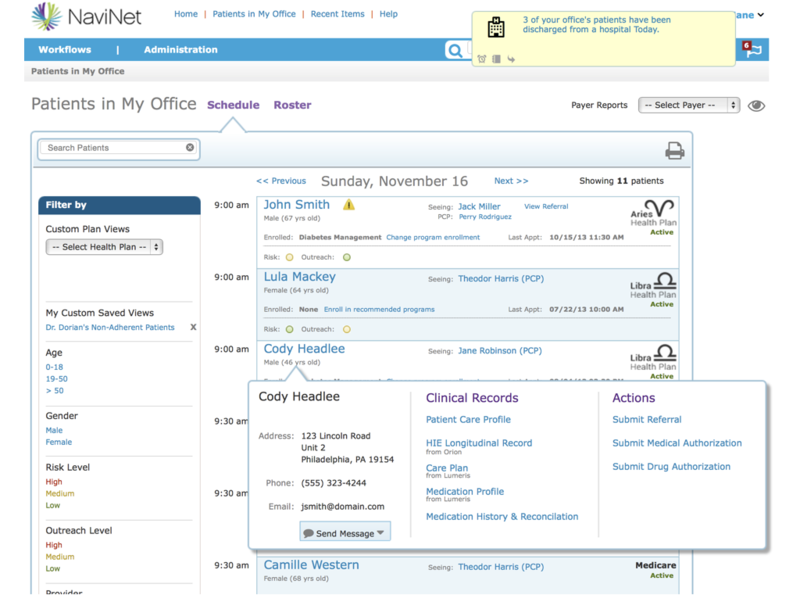 The office’s full patient roster can be viewed, but there also is a calendar view, which displays the upcoming appointment schedule. 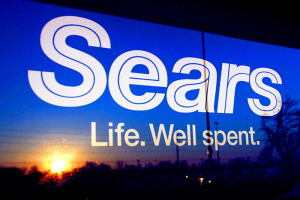 The list can be filtered, using a variety of different facets. The dashboard automatically shows real-time insurance eligibility information. It also offers care alerts, program enrollments, risk/outreach scores, last appointment date, and clinical documents provided by the health plan for each patient. In addition, users can directly submit referrals and authorizations without having to manually input any member information up front.